Musha Katana Sword | BUDK.com - Knives & Swords At The Lowest Prices! 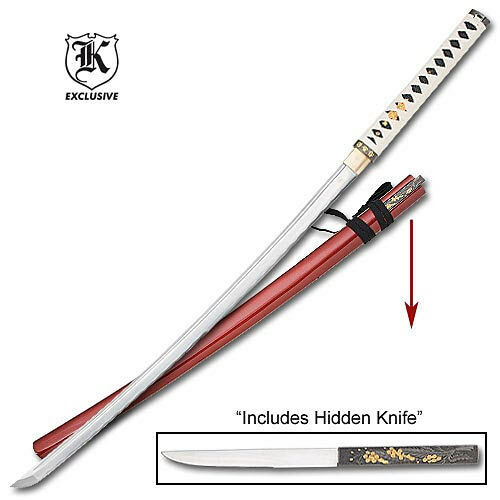 This quality sword exhibits the elegance and appeal that the Japanese katana is renowned for and makes it so sought after by serious weapon collectors everywhere! Measuring 39 1/8" overall, this distinctive katana features a 27 1/8" heat tempered, 1040 carbon steel blade. The hardwood handle offers white nylon cord wrapping with black ray skin underneath. This sword includes a bronze colored hardwood sheath. This is surely a katana that will claim a special place in any collection for its unique and attractive appearance!